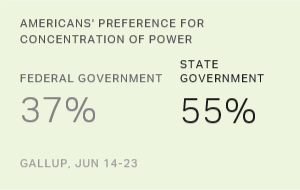 WASHINGTON, D.C. -- A majority of Americans (55%) favor the theory of government that concentrates power in state governments, outnumbering the 37% who favor power concentrated in the federal government. The latest update of this question -- asked only twice before, in 1936 and 1981 -- is from a June 14-23 Gallup poll. It comes as nearly half of the states sue the federal government over its directive to grant transgender students the right to use bathrooms and locker rooms that correspond with their gender identity. Schools that don't comply could risk losing federal funding. Americans' preference for state power was similar in 1981 -- the first year of the presidency of Ronald Reagan, who declared his support for states' rights on the prior year's campaign trail. In contrast, Americans slightly preferred federal power in the mid-1930s, after President Franklin D. Roosevelt unveiled a sweeping series of programs that increased the role of the federal government in Americans' lives. The current lawsuit over transgender bathrooms, which is being brought predominantly by GOP-controlled states, is one of many battles states have fought against President Barack Obama's administration. Obama was unsuccessful this year in defending his executive order on allowing undocumented immigrants to stay in the U.S. but won the fight to uphold the Affordable Care Act he signed into law in his first term. Views on this question are far from politically homogeneous. The majority of Democrats (62%) support concentrating power at the federal level, while majorities of independents (56%) and Republicans (78%) favor concentrating power at the state level. Democrats' preference for federal power reflects their party's underlying ideology and is likely related to having a Democrat in the White House. Meanwhile, about two in three state governors in the U.S. are from the GOP, and Republicans are more than four times as likely to prefer concentration of power at the state versus the federal level. Reflecting these partisan differences, a majority of Americans who approve of the job Obama is doing say they favor concentration of power in the federal government (53%), while 38% favor the states having it. By contrast, those who disapprove of Obama's job performance are more than three times as likely to favor concentration of power in the states (74%) as in the federal government (20%). Americans' preferences for how power is distributed in the U.S. have differed over the past century, and could change again as the politics of the country continue to shift. A reading on these attitudes at the start of a Republican's presidency some 35 years ago found the public leaning toward states' rights, but a reading 80 years ago during a Democratic presidency revealed a slight preference for federal power. If presumptive Democratic nominee Hillary Clinton loses this year's presidential election, Democrats could find themselves more amenable to concentration of power in state governments. Likewise, Republicans could become more open to federal power if a Republican again occupies the White House. Still, states' rights have long been a rallying cry of the GOP, and that seems unlikely to change as a result of the coming presidential election. Regardless of public opinion, the U.S. Constitution outlines strong federal powers, while giving all unenumerated powers to the states. The Supreme Court may choose to review any disputes between the two. Results for this Gallup poll are based on telephone interviews conducted June 14-23, 2016, on the Gallup U.S. Daily survey, with a random sample of 1,025 adults, aged 18 and older, living in all 50 U.S. states and the District of Columbia. For results based on the total sample of national adults, the margin of sampling error is ±4 percentage points at the 95% confidence level. All reported margins of sampling error include computed design effects for weighting. The economy tops Americans' concerns, as it has for several months. Republicans continue to be more likely than Democrats to mention the economy. GOP dissatisfaction outpaces that of Democrats. For the third year in a row, a solid majority of the American public believes the federal government has too much power. The number has grown in Obama's second term, with Democrats, moderates and liberals becoming more wary. Almost half of Americans, 49%, say the federal government poses "an immediate threat to the rights and freedoms of ordinary citizens." This is unchanged since 2010 but up from 30% in 2003.